One of my favorite parts of the My Father’s World curriculum is the encouragement to get your kids outside and study nature.While we don’t always get to do our nature study every week, I have made a conscious effort to regularly take my kids out and learn about the plants and animals that are here where we live. We are keeping a nature notebook for kids this year, and I thought it would be helpful if I gave some tips on how we are doing it! My first tip is to use notebooking pages! Our notebooking pages are from Notebookingpages.com. I chose a specific page for our notebook that included a few lines to write down some facts about whatever we are studying, and also a space for drawing. 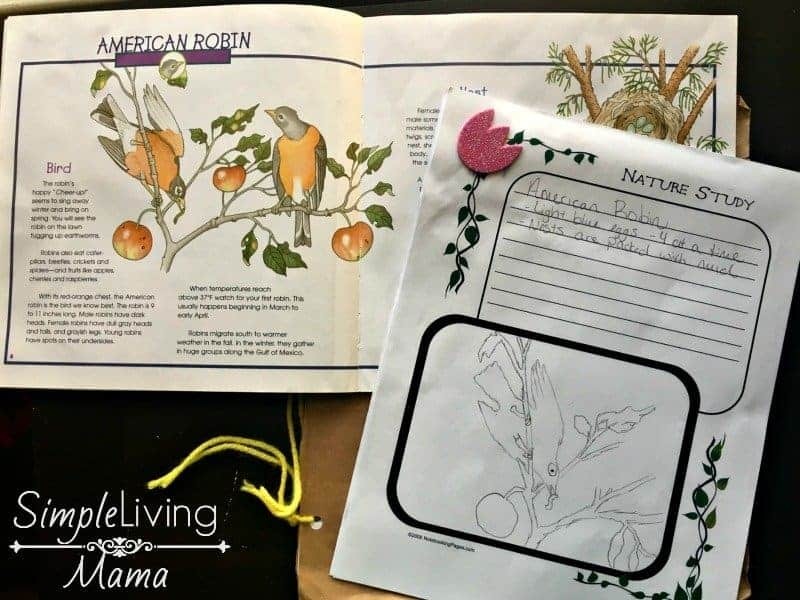 With the Lifetime Membership you get access to all kinds of wonderful notebooking pages, including a variety of topics of nature study. Since we study something different every time we go outside, I decided to use the Nature Log and Journal pages. These are open-ended, so we can journal about whatever suits our fancy that day. The Lifetime Membership includes notebooking pages on just about everything you can imagine. 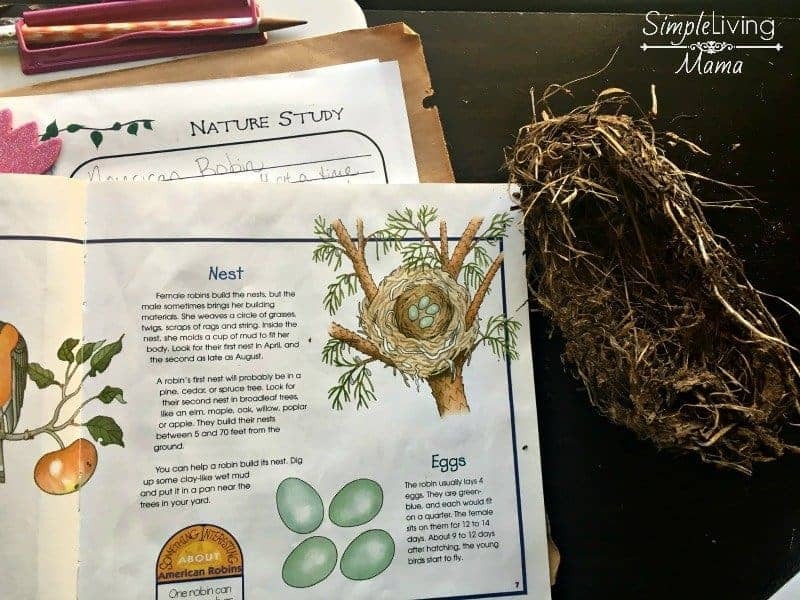 With nature study, you can journal about plants, animals. habitats, seasons, weather, and much more. I also appreciate that their website offers suggestions for how to use the pages. My next tip is to just get out into your backyard and learn about what is out there. I bet you had no idea the number of species of birds in your backyard trees. Maybe you’re clueless about the robin’s nest in the tree nearest your house. We actually found this robin’s nest in a tree right next to our patio. It’s fascinating to learn who your wildlife neighbors are. I like to provide my kids with helpful books that allow us to identify the plants and animals we find. Some of my favorites are these Take-Along Guides. I’m also very interested in Nature Anatomy, and of course Anna Comstock’s Handbook of Nature Study. 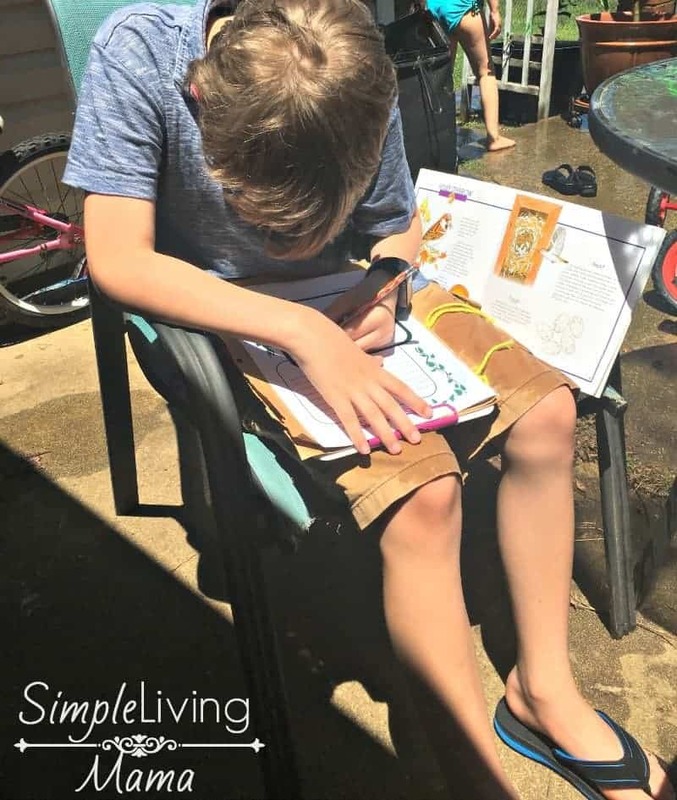 One of my favorite tips is to take your nature notebook outside and journal right there. 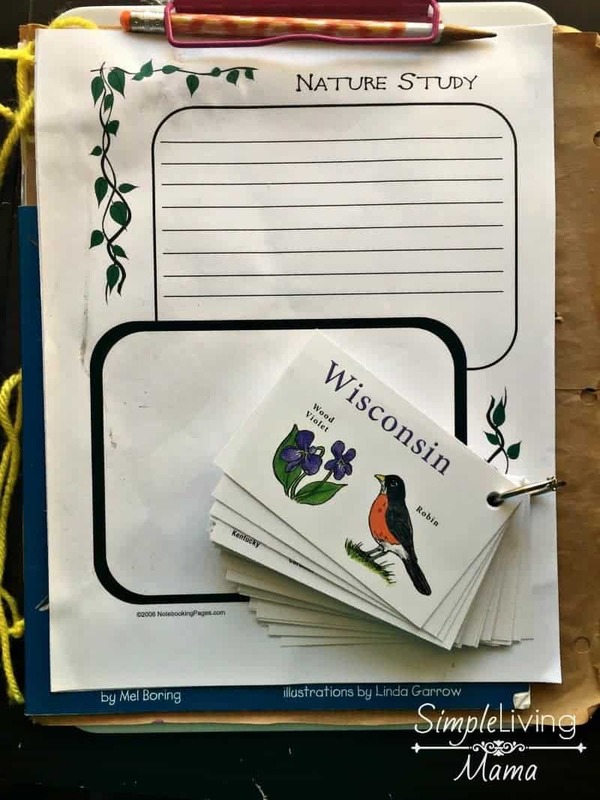 We put pages on clipboards and take our guides along with us and draw what we find. It makes for a fun little outing with the kids. 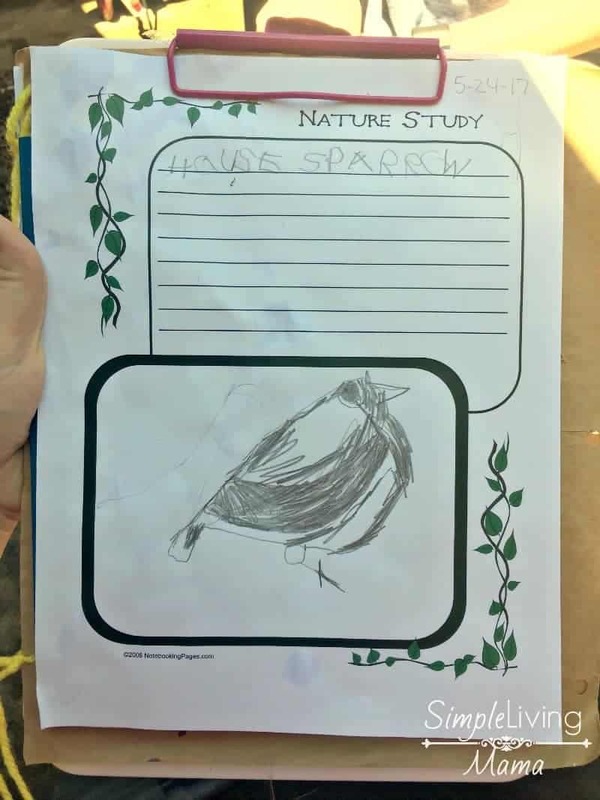 My son wanted to draw a picture of a house sparrow, so that is what he notebooked. I didn’t even take out any art materials other than a pencil. You can always sketch and then come inside later and use water colors or colored pencils. 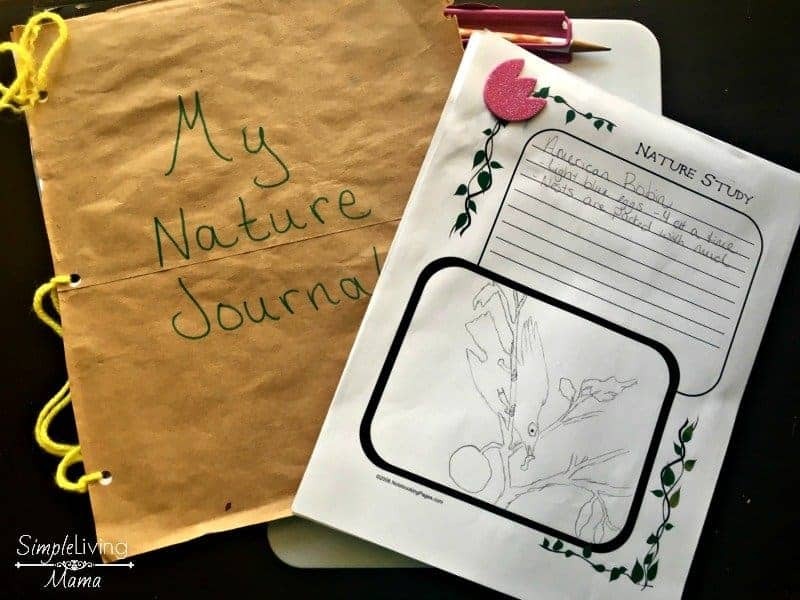 I made this super easy DIY Nature Journal several months ago. When I make my new nature journal I will include several pages from Notebookingpages.com because they make nature notebooking easy! 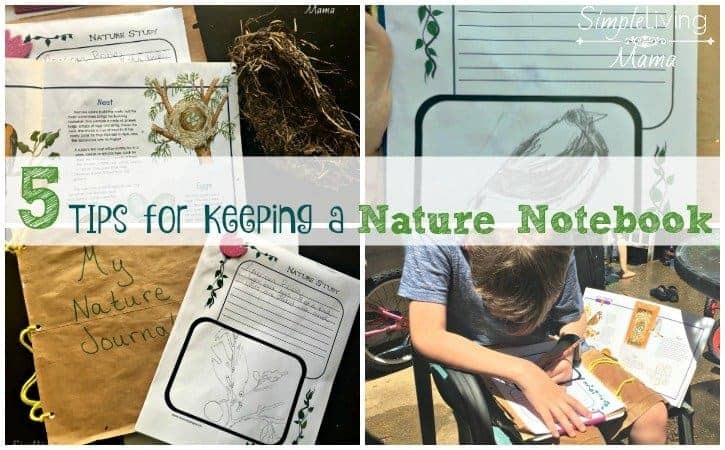 Get outside with your kids and create a nature notebook! You can keep it for years to come and you’ll be surprised at how much you all learn!